Two new Harry Potter books are scheduled to be published in conjunction with an exhibition this fall at the British Library. The Harry Potter exhibition, "A History of Magic," will open in October 2017 and run through February 2018. The books will be published by Bloomsbury in the UK. 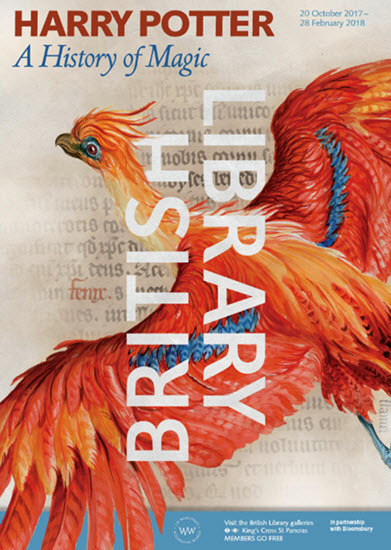 The exhibition poster features Jim Kay's phoenix illustration as seen in the Harry Potter and the Chamber of Secrets: Illustrated Edition. A post on Pottermore says the exhibition will have over 100 artifacts on display. The exhibit will also feature hand-picked items from J.K. Rowling's archives. It was created to celebrate the 20th anniversary of Harry Potter and the Philosopher’s Stone. Pottermore also has details on the two exhibition companion books. Harry Potter: A History of Magic will be published in print and ebook formats. It will include exhibit information, artwork and interviews with the curators. There will also be a version for younger readers, called Harry Potter: A Journey Through a History of Magic. It will also be published in print and ebook formats. A CNBC story says the books will examine magic subjects studied at Hogwarts. There are not details available yet about any possible U.S. version of the books.